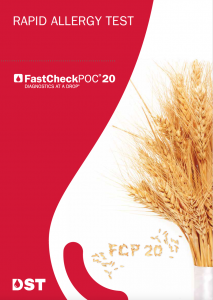 FastCheckPOC® 20 rapid allergy test covers some of the most prevelant allergies, inhalation and food, worldwide. FastCheckPOC® 20 is ideal for healthcare professionals to screen their patients for allergies during consultation. FastCheckPOC® 20 results are semi-quantitative, i.e. the visual categorization into 5 levels enables the classification of the allergy test results into respective CAP classes. 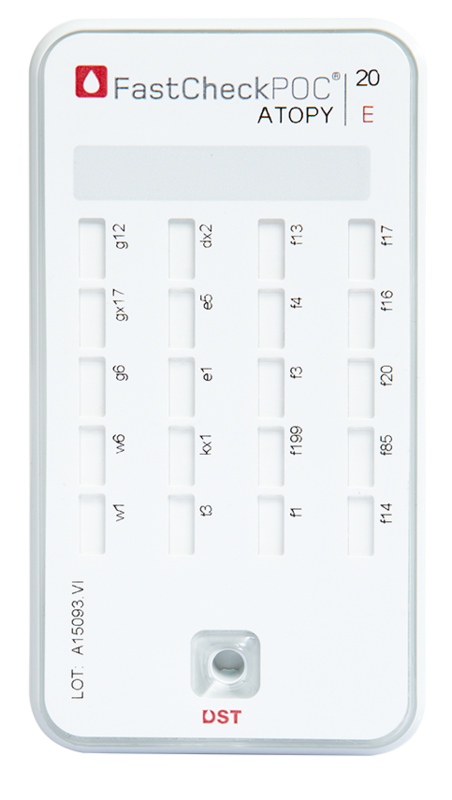 FastCheckPOC® 20 is also ideal for testing as secure alternative to common test methods that could lead to anaphylactic shocks and are not indicated, e.g. for pregnant women, children, patients with acute skin conditions or taking antihistamines. FastCheckPOC 20 ATOPY was tested in a multi-center performance study at 6 sites including hospitals, allergy centers, and medical practices. In total 200 patients were tested using the FastCheckPOC 20 ATOPY, results were compared to laboratory test (ImmunoCAP). • Sensitivity of FastCheckPOC 20 was 82%, specificity was 84%.